The renovation of the 83,000 sf Old Chem. building and the addition of 25,000 sf which added three 250 seat lecture halls has transformed Old Chem into a general classroom building for use by the entire university. The new academic building and addition has strengthened the visual and social link between the Library and the New Chemistry Building. Frey Hall reinforces the edge of the existing campus green and the zebra walk and creates an active dialog between nature and the built environment. The building has been renamed Frey Hall in honor of Philanthropist and educator Dr. Robert Frey. 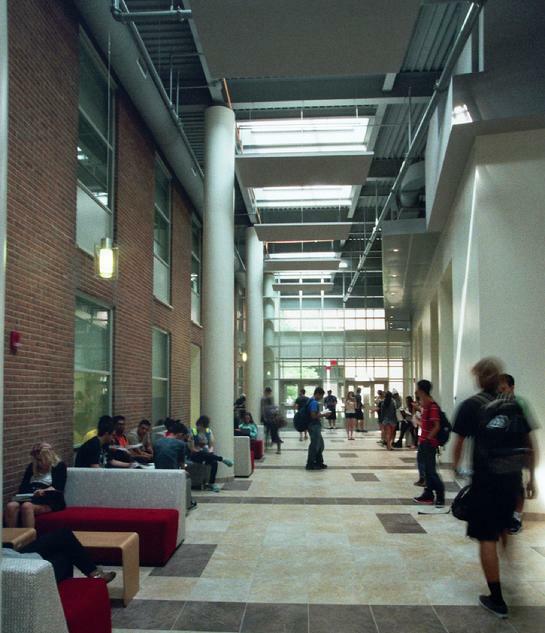 The interior architecture fosters a sense of community and common identity for both students and faculty. The interior layout facilitates collaboration, is active and engaging, and encourages informal interaction. A variety of types, sizes, public, and private meeting and gathering spaces address flexibility in use and configuration. The spaces enable state-of-the-art technologies and provide opportunities for collaborative learning that are active, experimental and based in group learning. The new active learning classroom is one of the most innovative teaching spaces on campus. This project will meet the U.S. Green Building Council’s LEED Silver Certification.